According to reports from U.S. safety regulators, these vehicles are being recalled because a fuel pressure sensor may not have been tightened properly in production. This, of course, was the course of a similar Nissan recall back in 2012 in which 53,600 Jukes were recalled. Isn’t it strage that a company could make the same mistake over and over? 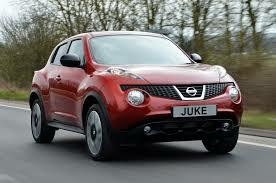 This entry was posted in Culture, Nissan and tagged 000, 470, 470000, infiniti, Nissan, Nissan Juke, recall. Bookmark the permalink.